If you are looking for a water to produce consistently good sport and close, fair matches, you don’t need to look further than Garbolino Tunnel Barn Farm. The venue has eight pools plus a 2.5 mile length of the Grand Union Canal. In total there are over 130 pegs, and there’s an excellent clubhouse where food and drinks are available. The stocking profile of the stillwaters leans heavily towards smaller carp, including a big head of F1 hybrids. There are also chub, skimmers, brown goldfish and tench to be taken and along with F1s and carp from 4-8lb, that stocking profile describes what’s gone into the newest pool, the Canal, which is already producing weights close to 90lb within weeks of opening in summer 2005. The Canal is reserved for club contests and although bookings are being taken already for 2007, there are still dates left this year. Most of these are now just over the 1lb mark, fish of just the right size to be catchable all year round, making the water popular in winter as well as in summer. 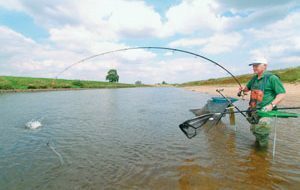 Because of the size of the fish, regulars approach the water like a scaled up canal session, especially in the cooler months when bites can easily be missed. When we visited the water in spring, our guide Richie Hull set up three rigs. The first sported a 4×14 Trabucco Power Carp for fishing at 13 metres in five feet of water. His second rig was a 4×14 Trabucco Ultimate for fishing at six metres in five feet of water and his third a 4×12 Trabucco Power carp float for fishing in the shallowest part of the swim. The rig line was 0.12mm diameter tied to a 0.10mm diameter hook length, but in summer he would step that up to 0.12mm straight through. Shotting patterns were all the same, a bulk of No10s set well away from the hook, plus a couple of No11 droppers. Richie likes to feed some groundbait at the start, topping up with pinkies and maggots after that in winter and using pellet in summer. “Groundbait does help attract fish in colder water as long as you are cautious with it,” he says. “The main rule is to use a groundbait with little or no feed content because you want it to attract, but not fill up, reluctant feeders. I like to start off by cupping in one or two balls on each line and judge things from there. “When I feel it’s going to be hard I like the very low feed Dynamite Baits black Swim Stimm groundbait,” he says. The consistency of Tunnel Barn has been recognised and the venue is starting to attract some high profile matches, including the Premier League final, a Fish O Mania heat and the Midlands Van den Eynde Clubman semi final in 2003. 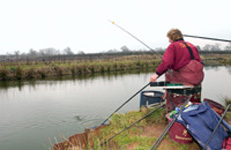 The water also holds a winter league which attended by some of the top rods in the Midlands, running from mid November for eight weeks. There is also a festival in October for the 50 matchmen who fish the most in any given year. £1 is placed into a kitty from every peg fee throughout the year in the opens, and the anglers fish off for the money in two seeded sections in the festival. Owner Mike Hamlington opened the venue some 14 years ago, but it’s only in the last two years the venue has really attracted a lot of publicity. 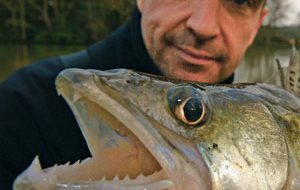 “The key is the stocking of smaller fish, which feed all year and produce incredibly tight matches. Often, even though you will need 40lb to win, less than 3lb will cover the top five here,” he says. The opens are held on House One and Two. House Two’s peg nine is a noted swim and holds the match record of 99-4-0. Other noted swims include House One pegs 29 and 30 and House Two peg 21, although any peg can win. The Top Pool has been designed for club events while the Bottom Pool is a big fish venue holding carp to over 30lb. A new club pool opened in 2004 holding 25 pegs. This mixed water is proving to be an excellent club match venues, generally producing winning mixed bags around 45lb. Richie’s choice of hook when fishing for carp with small baits in cold conditions is the silver barbless Mustad Wide Gape Canal Seed, a pattern which holds a good middle ground between strength and fine wire. “You need a fine wire hook when fishing small baits like single pinkie or single maggot, even for carp,” says Richie. Day tickets: £9 (£7 concessions). Matches: Opens are held Monday, Wednesday, Wednesday evening, Thursday, Saturday and Sunday. Club bookings welcome. The match record is now 172lb, taken in May 2005 by resident ace Pete Rice who is available for coaching and will provide tackle. The water also operates a ‘try before you buy’ deal with the current range of Trabucco poles. Restrictions: No floating baits as feed. Other than that there are no bait bans, just a request to use all baits in moderation. It’s barbless hooks only and two keepnets are needed in summer matches. How to get there: From the M42 Junction 4 take the A34 Stratford road to Hockley Heath, where you turn off left and follow the old Warwick road for about six miles. Turn right into Shrewley and the entrance to the fishery in on the right hand side, just before you come to the telephone box on the left.